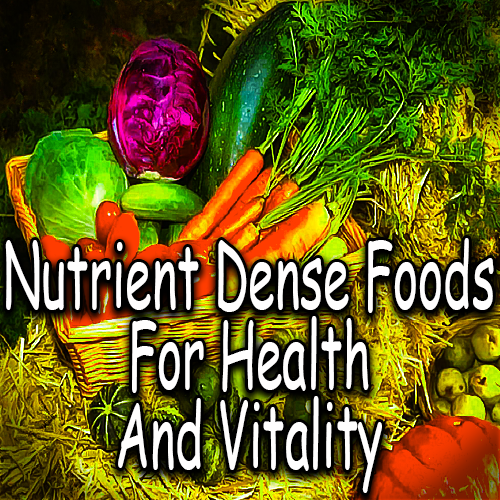 Nutrient dense foods provide the raw materials to grow and maintain a healthy body. Our bodies need vitamins, minerals, trace elements and thousands of phytochemicals (Plant nutrients). We need this never-ending supply in order to maintain our hundred trillion cells in their never-ending struggles to keep us alive. Each cell is a tiny factory with three to five million events taking place at any one time. Most or all of these important nutrients become stored in our fat cells, bones, muscles and various little warehouses scattered throughout our bodies. We can survive for many weeks without food, but not without water. These nutrients can be easily destroyed or damaged by the processing and preparation that seems necessary to appease our appetites. Minimal preparation will do minimal damage to these fragile nutrients. Heating above135 degrees does the most damage. Therefore it is best to eat them raw or at least minimally cooked. The body will make its own protein. Just like cows, horses, deer or great white apes do. Just give yourself the raw materials and enzymes. These and many other important nutrients are available in the storehouses of food like nuts, berries and raw greens. Eat a wide variety of brightly or densely colored and, preferable raw, vegetables, nuts, fruit and grains. I am not sold on wheat and other cereal grains as they have an awful lot of starch and they make me too placid, sleepy or tired. Food supplements and vitamins are also off my list. I don’t think that I need them. If you have special needs that are not met by your diet, you might need them. The Cleveland Clinic book on Healthy Heart and Lifestyle says they aren’t of much value. You should get your needs from your food. For example, they state that raw broccoli releases valuable nutrients as you chew it. Also, these need to combine as they release in combination with other nutrients that release at the same time. Collard greens and other unprocessed foods have kept the hard-working people healthy for thousands of years—give it a try, you might like it. T. Collin Campbell, PhD (Coauthor of international bestseller The China Study is an interesting read doe this type of thinking. David Wolf, Author of The Sunfood Diet Success system also has an interesting read on raw foods.